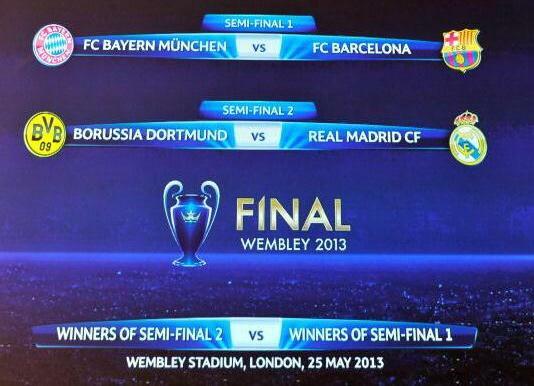 The semifinal draw for the 2012/2013 Champions League provided for the possibility of an El Clasico final at Wembley as Barcelona were drawn against Bayern Munich and Real Madrid against Borussia Dortmund. Bayern and Dortmund will host the first legs ( to be played on April 23 and 24, 2013) while the return legs will be held on 30 April and 1 May, 2013. Madrid and Dortmund, of course met in the group stages earlier this season with Dortmund prevailing 2-1 in Germany and holding Madrid to a 2-2 draw at the Bernabeu. The draw for the Europa League semifinals pitted Fenerbahce against Benfica, with Chelsea drawn against Basel, who knocked out Tottenham on penalties.